I have been using computers since Atari GEM which now can be completely built as a web app using php probably with just a few lines of code. How many people remember that one, Its been around for quite a while I think i starting with computers in 91 i was like 13 not because i could afford it oh no i was poor but had friends in the right places to some stuff and the atari was my first. I now have several high and low end machines that i use. 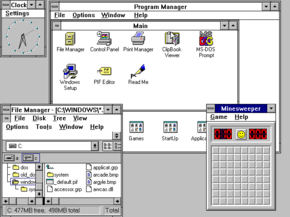 Windows 3.11 - that brings back some memories. When windows was just one step above DOS. Those where the good ole days when the computer could run on 8 megs of memory. As compared to 1 gig required by vista. Things sure have changed over the past 15 years. My first computer ran windows 3.11, had 8 megs of memory, had a 75mhz processor and a 1.2 gig hard drive. After the first major upgrade, I was running windows 95, 32 megs of memory, and a 166 mhz processor - and that was top of the line for back then. The fastest CPU on the market was the 233, but that one cost a fortune. That was back when memory cost more then $2 a meg. That 32 megs of memory cost me $64. Last edited by ~kev~; 10-02-2009 at 09:47 AM. Wow, I feel old, my first computer was a Sinclair ZX-81! Check out the Obsolete Computer Museum website if you have a couple of days to lose! I just realized that there is another thread for this topic. I guess i did not see that that thread when i started this one..
Well my first computer is a DX4 that was given to me by my first boyfriend after he upgraded his computer. Then after that he bought me a AMD K2 CPU which i never used that much either. He is so generous but we parted our ways. My first computer was DX4 and he is like my child, now i have my own laptop but still i love my old and innocent DX4. My first computer was a Asus DX2 486 50mhz. Was so proud of it - It had "everything"